I recently learned the difference between white rice wine and yellow rice wine. The normal Chinese rice wine for cooking is the Shao Hsiang Hwa Tio brand. The yellow rice wine is made of glutinous rice. I bought a bottle of the yellow glutinous rice wine for less than RM10. It is meant for cooking only. I used the wine to prepare drunken chicken. I haven’t get the kind of drunken chicken I like. 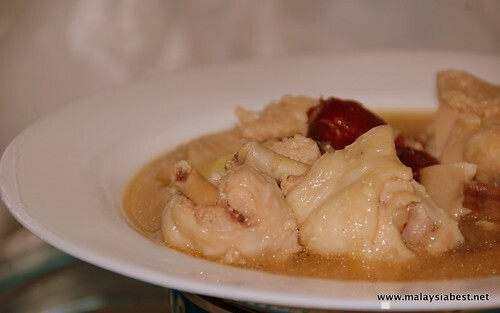 It is done by soaking the steamed chicken in the mixture of yellow rice wine, white rice wine and the chicken stock for two nights. Since the end result is not what I expected, I shall experiment further and share the real drunken chicken recipe next time. 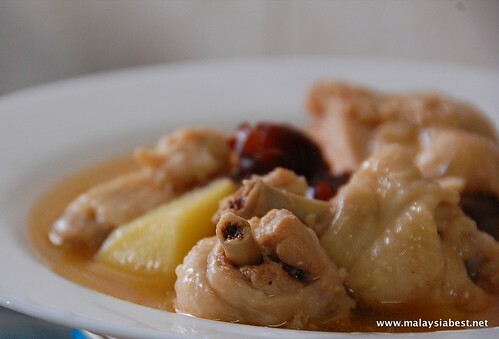 Meanwhile, I use the yellow rice wine to cook chicken with dong guai, wolfberries, red dates and longan. The end result is just like the chicken I have during the post natal period. However, I only use 2-3 small slices of dong guai as it is rather ‘heaty’ to take too much. Add ginger and stir fry till fragrant. Add chicken to brown. Put the water and wine. Add the longans, red dates, wolfberries and dong guai. Simmer till chicken is tender. Note : Dong guai and alcohol can cause bleeding so do not take during the post natal period when you are still have post-partum bleeding. During normal time, only take this after your period and not during or just before your period. Wow… lilian, this dish realli look great!!!! I love any chicken dishes that is cooked with yellow wine…..:) The taste of a good yellow rice is so sweet and fragrant…. yummy!!!! Where to get the yellow rice wine? i love this dish! my mom nvr soak the chicken, but only saute somemore ginger, then add in lots of yellow rice wine and a little bit of dark soy sauce and it taste super delicious! it goes along really well with button mushrooms too! Wow….this dish is really great! but then where to get yellow rice wine? However, i think if we use ginger wine instead, the result shall taste great too. wow…sounds great!! pictures of mouthwatering dishes…. well Domino and Sammie you can get all the ingredients at http://www.myethnicworld.com it’s a great resource…i too obtain the ingredients form there itself.